Tractor-trailers are the biggest fuel users among heavy-duty vehicles, responsible for two-thirds of heavy-duty oil consumption. Therefore, getting major fuel efficiency gains from tractor-trailers is key to an effective program. Long-haul tractor trucks are good candidates for rapid uptake of new technologies due to their high fuel consumption and high mileage—more than 100,000 annual miles for their first several years on the road. Clearly, fuel efficiency investment pays back quickly. Inclusion of trailers in Phase 2 was a crucial step forward, because known, affordable trailer aerodynamic and tire technologies can deliver over 10% fuel savings for tractor-trailers. Tractor truck engine efficiency will improve 5% by 2027. 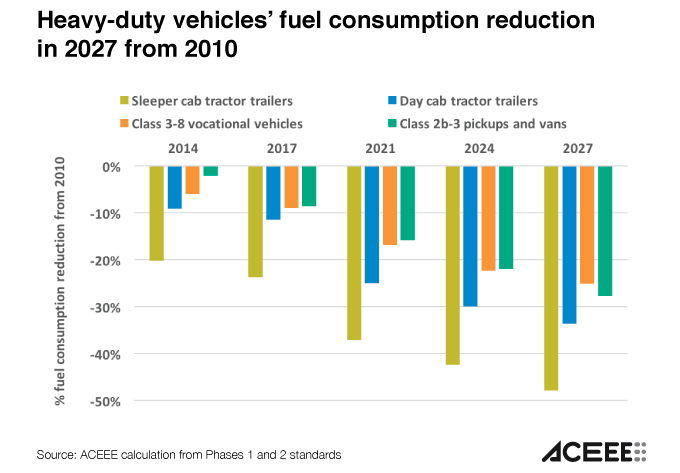 Combining improvements from engines, transmissions, aerodynamics, tires, and trailers, average tractor-trailer fuel efficiency will almost double from 2010 to 2027. The vehicle certification protocols in Phase 2 will promote integration of engine, transmission, and vehicle components. The modeling tool for calculating vehicles’ fuel efficiency and GHG emissions (GEM) has become more sophisticated, which will allow many more technologies to contribute to vehicles’ certified fuel efficiency. 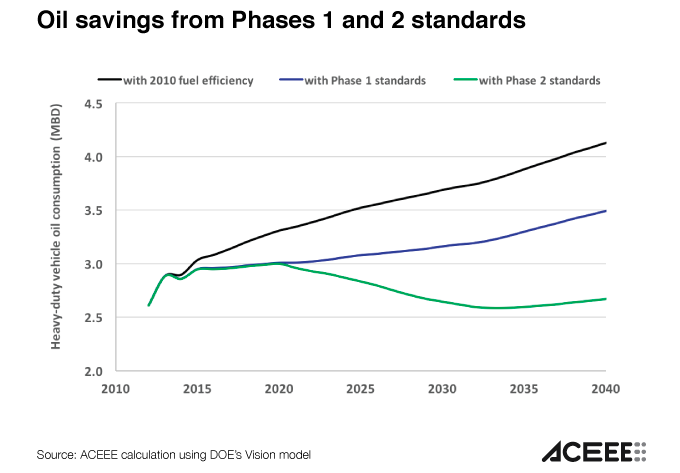 Improved categorization of vehicles, inclusion of road grade, and re-weighting of certification cycles will help certification values closely mimic real-world fuel efficiency. The Phase 2 standards are highly cost-effective. A typical buyer of a new long-haul truck in 2027 will recoup the cost of the added technologies in under two years through fuel savings. The program will provide continuity and certainty to manufacturers, deliver savings at the pump to truck owners and operators, and reduce freight costs. The 37% overall reduction in heavy-duty vehicle fuel consumption from Phases 1 and 2 together will yield savings of about 1.5 million barrels of oil per day (MBD) in 2040. The Phase 2 standards are a win-win-win for the transportation industry, consumers, and the environment. The new program enjoys wide-ranging support from engine and truck manufacturers, suppliers, fleets, and the environmental community. Cummins, Daimler, Con-way, FedEx, UPS, Waste Management, and PepsiCo, among others, have endorsed the new standards.